The Maltese archipelago lies in the central part of the Mediterranean. People who once peopled it seems, arrived in the VI-V millennium BC from Sicily, located 90 kilometers to the north of Malta. They chose not paradise. Small islands, an archipelago of pretty poor. There are almost no rivers; no normal conditions for farming. It is difficult to understand why in the Neolithic Maltese archipelago was inhabited. Still wonder why about 3800 BC - more than a thousand years before the official appearance of the pyramid of Cheops! - Islanders begin to build huge megalithic temples. In total some 100 years ago, these buildings belong to the monuments of the Phoenician culture, and a new dating techniques have allowed to specify their age.Until the discovery of Gobekli Tepe, they were considered the oldest stone temples in the world. Scientists continue to argue about how culture is born of such buildings, whether it was brought to the island from somewhere in the East, or created by local residents. A total of Malta and its adjacent islands has 28 temples. They are surrounded by walls of stone blocks and partly reminiscent of Stonehenge. The length of the wall is an average of one hundred and fifty meters. Temples are focused strictly on the south-east, and in the days of the solstices the light falls directly on the main altar.Some of the temples are located underground. 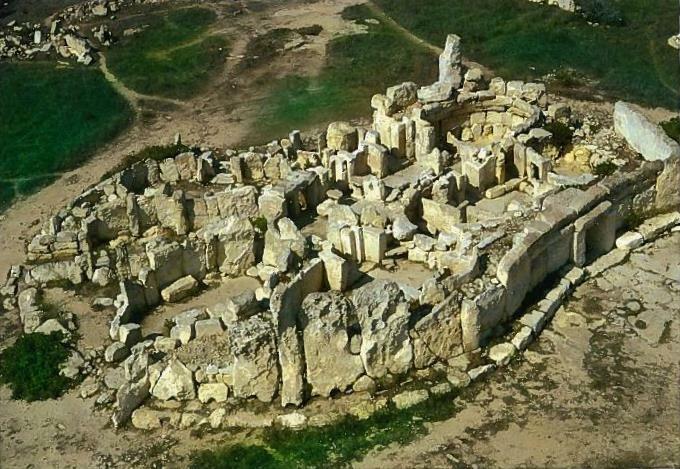 The oldest two are considered to be the temple, which form the Sanctuary of Ggantija ("Giant") on the island of Gozo. Built on a hill with 115 meters, they are clearly visible from afar. Both temples are surrounded by a common wall. Senior ("Southern"), the temple consists of five semicircular apse, which are arranged around a courtyard in the form of a trefoil. Some apses "south" of the temple and in one of the apses of the "northern" temple still can be seen, where the altars. The height of the exterior walls in some places up to 6 meters, and the weight of some of the limestone quadras exceed 50 tons. Clumps fastened something of the solution. Preserved traces of red paint. In ancient cults that color attributed magical powers; it could mark the rebirth, a return to life. Here it was discovered a fragment of a female statue height of about 2.5 meters. 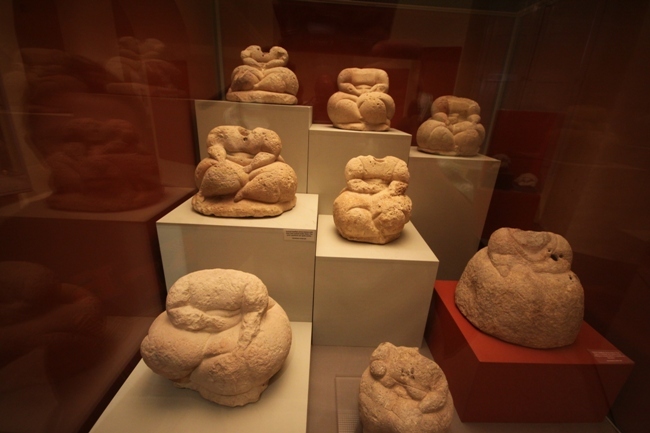 This - the only major sculpture found on the Maltese archipelago. In all other ancient temples found only small figurines maximum height of 10-20 centimeters. 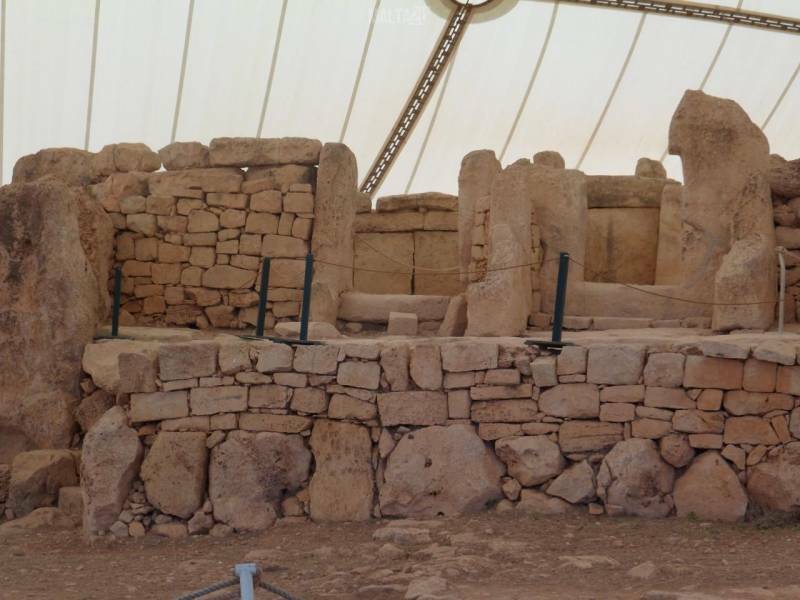 According to some researchers, Ggantija was a sort of "Vatican" of the Neolithic - the center of all spiritual and secular life of the Maltese civilization.Apparently, the sanctuary was once blocked the arch, but its remains have survived. In a similar plan, and churches were built on the island of Malta. We know little about the people who created this megalithic culture. We do not know who they were, what gods worshiped what festivities were made in the walls of these sanctuaries. Most experts believe: that the local churches were dedicated to the goddess, which in ancient times was known as the "Magna Mater" - the Great Mother. In favor of this hypothesis and archaeological evidence. 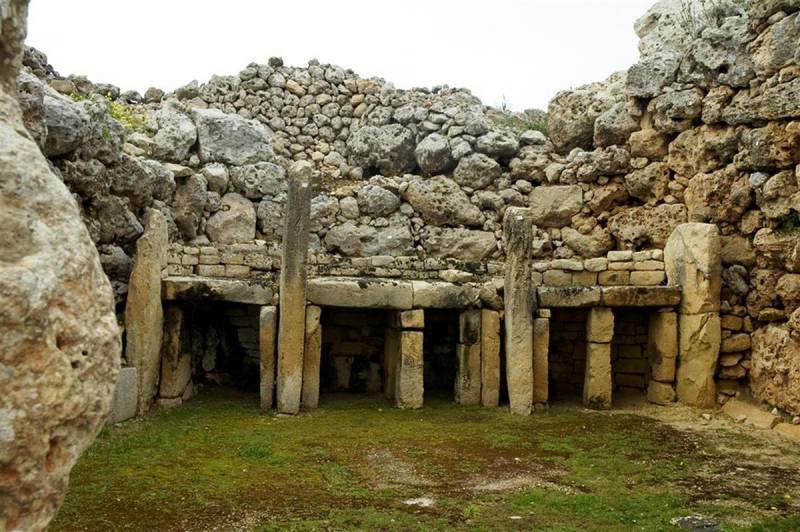 In 1914, during plowing, it was accidentally discovered boulders sanctuary Tarxien, long time hiding in the ground. Director of the National Museum of Themistocles Zammit after a cursory inspection area decided to begin excavation. In the six years of work it was discovered four interconnected temple, as well as numerous statues, including two half-meter sculpture FatLadys, «The Maltese Venus." Plates temples decorated with reliefs depicting pigs, cows, goats, framed abstract patterns such as spirals. It was believed that symbolize the all-seeing eyes of the spiral of the Great Mother. Excavations have shown that there is sacrificed animals. The oldest of these temples built around 3250 BC. During the construction of the temple complex covers an area of ​​10 thousand square meters, used limestone blocks, weighing up to 20 tons. They are walking with a stone roller - like those that were found near one of the churches. In the south-eastern outskirts of Valletta is an underground sanctuary Hal Saflieni (3800-2500 BCE). In 1902, excavations began here, "the father of Maltese archeology," the Jesuit Emmanuel Magri, and continued it after his death, Themistocles Zammit. Soon huge catacombs were discovered in which several tiers of the remains of more than 7,000 people. Somewhere in the vaults of the catacombs ornaments stood out above all the spiral-colored red. We now know that this complex served as both a necropolis and temple. The total area excavated sanctuary is about 500 square meters. But perhaps the catacombs extend for the entire capital of Malta, Valletta. This - the only entirely preserved sanctuary of the Neolithic. We can only guess that behind the scenes played out in these halls. Maybe there bloody sacrifices?Inquire of the oracle? We communicate with the demons of the underworld? Asked souls of the dead to help them in everyday storms? Or dedicated young women priestesses of the goddess of fertility? Or here, on the threshold of death, healed the sick from illnesses and in gratitude to the goddess figurines are left? Or limited burial rituals? Rites perpetrated over the bodies of the dead? Or maybe it was more prosaic, and here, the underground hiding place, cleaned the grain harvested in the county? Among the thousands of found here - no grains, figurines - particularly well-known uses Sleeping Lady, «Sleeping Lady", which resembles a giantess. It rests on the bed, turned on the cozy side. His right hand, she put it under his head, tightly pressed to the left chest. 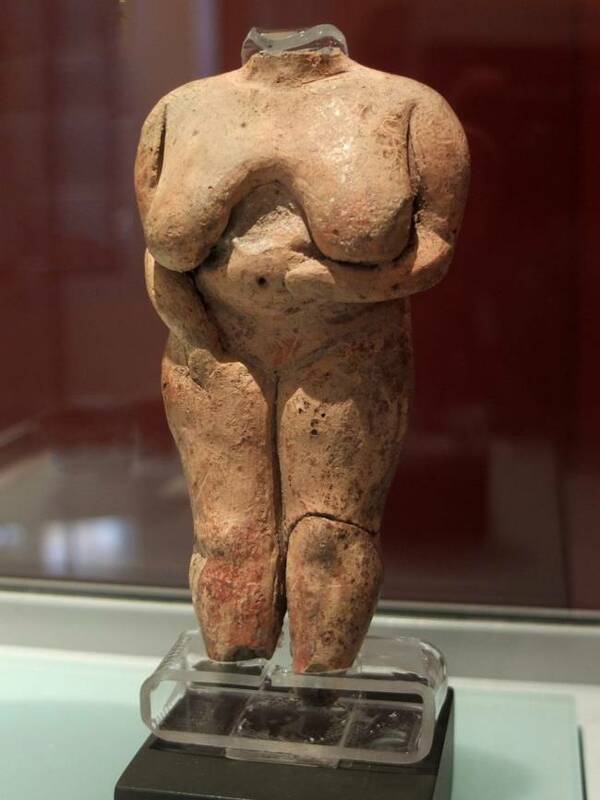 Her skirt, fitting huge thighs, heaving like a bell; from beneath her feet look out.Now this figure height of 12 cm is kept in the Archaeological Museum of Malta. 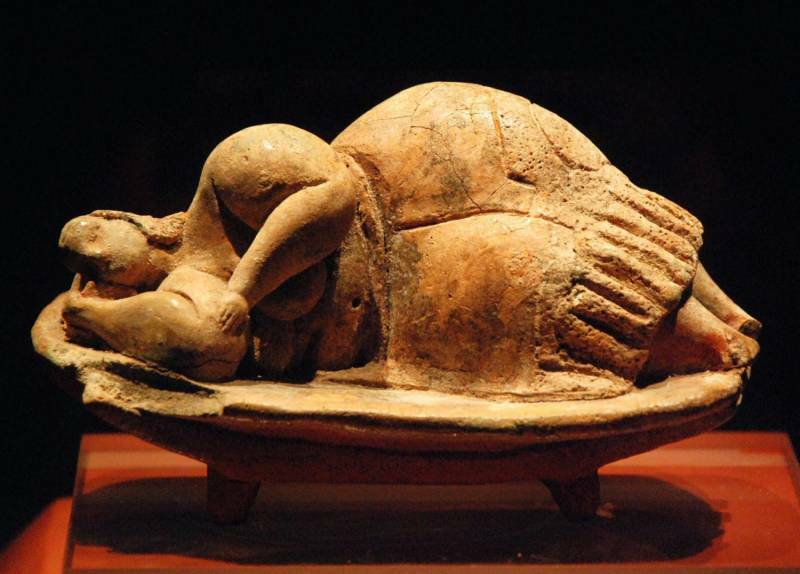 This and other findings suggest that 5000 years ago, in Malta there were matriarchal society, and were buried in the underground necropolis of notable women - fortune teller, priestesses, and so on. N. However, this interpretation is controversial. In fact, in some cases difficult to establish whether these figurines depict men or women. Similar figures were found during excavations and Neolithic settlements in Anatolia and Thessaly. Later, by the way, it was discovered sculptural group, dubbed "The Holy Family": There are a man, woman and child. The building of temples ceased around 2500 BC. Perhaps the cause of death of the megalithic civilization of Malta was the prolonged drought and the depletion of arable land. Other researchers are inclined to believe that in the middle of the III millennium Malta invaded the warlike tribes, armed with the most powerful weapons then copper. They captured the blessed "island of great magicians, healers and seers", as commented on Malta Ancient historian. Culture, which flourished for many centuries, has been destroyed in a moment. Archaeologists have yet to reveal many of its secrets. And maybe, in this archipelago have never lived people? They sailed here from the mainland to perform rituals in the temples or to bury the dead here, and then left the "island of the gods"? Maybe, Malta and Gozo have been something of a holy district of the Neolithic people?